Taipei, Sept. 9 (CNA) A tropical storm that formed over the Pacific was upgraded to Typhoon Mangkhut Sunday afternoon and is expected to intensify with the possibility it could reach Taiwan Saturday, the Central Weather Bureau (CWB) forecast. As of 2:00 p.m. Sunday, the typhoon was located about 3,000 kilometers from the eastern coast of Taiwan traveling at a speed of 34 kilometers per hour in a westerly direction, according to the CWB. Mangkhut is packing maximum sustained winds of 126 kph, with gusts of up to 162 kph, according to CWB data. Meanwhile, a tropical depression over the Bashi Channel between Taiwan and the Philippines is expected to bring rain to southeastern parts of Taiwan, according to the CWB. 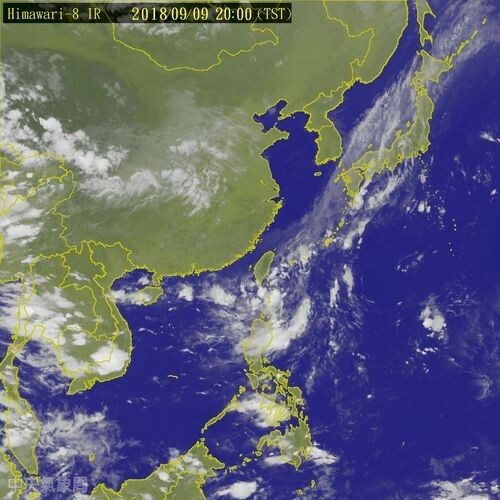 Lu Kuo-chen, director of the bureau's Weather Forecast Center said the tropical depression was approximately 240 km from Erluanbi -- Taiwan's southernmost tip -- Sunday. While bringing rain over the next two days to southeastern parts of Taiwan, including the Hengchun Peninsula, the tropical depression yet could be upgraded to Typhoon Barijat Monday, Lu said.